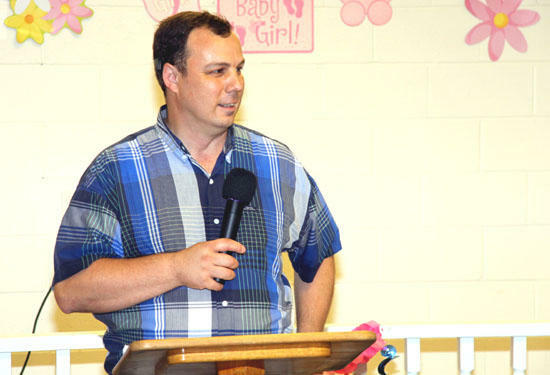 Perry Louden of the Cannon County Community Advisory Board helped organize the baby shower. The Cannon County Community Advisory Board (CAB) sponsored a baby shower for teen and young adult mothers at Sunday at the Woodbury Lions Club. At the shower mothers received needed baby equipment, supplies, clothes, and information from public assistance agencies such as the Department of Human Services, Department of Children Services and SAVE. Those in attendance heard stories of the issues faced by young mothers and the obstacles they have to overcome, along with information about how to find services that can assist them. There were experienced sponsor/mentor mothers on hand to answer questions and give practical advice and information. During one of the presentations, participants heard the story of one teen mother, Kelly Cosgrove, who said via a letter and YouTube video, "I look as things as a mom now, not as a teen ... the most beautiful things in our life can sometimes come from our most awful mistakes." Perry Louden, who serves as the facilitator for CAB, said the event was one of the efforts the organization does to "give back to the community." Jessica Tucker, who works for DCS, spoke about the Tennessee Early Intervention Services programs and other assistance offered by the agency. "We want to help you find resources in the community that can help you with those things that you and your child need," she said. Lisa Baird, who is the director of SAVE, Cannon County's agency to assist victims of domestic violence, said, "Hopefully you will never need our services, but we are here if you do." Baird said SAVE could also help with diapers, clothing and educational materials. Shirl Louden, who works with DHS and is station at Middle Tennessee Medical Center, talked about Tennessee's Families First program, which can help with signing families up for health insurance, transportation, clothing, food stamps and other necessities. Perry Louden said CAB is still in need a car seat and two cribs for three of the girls. Louden added, "We would like to thank these organizations for helping us make this possible: Woodbury Lions Club, Jenny Grady of River Park Hospital, Cannon Community Church, Adventist Community Services, Women’s Ministry of the Seventh-day Adventist Church, Bags of Love, SAVE, Millennium Hair Salon, Hot-Spot Tanning and Briar Rose." Any agency, organization, church or individual that would like to help people in our community is welcome to be members of the Cannon Co. CAB. Meetings are the first Tuesday of each month. Contact Perry Louden, CAB Facilitator, at 796-7020 or perry.louden@us.army.mil.